Flans and quiches that are quick to make are ideal for family dinners. Either rustle one up when you get home from work or have a baking day and prepare a few for the freezer. If you are not confident making pastry then purchase the ready-made variety from your supermarket. It is less messy and guarantees a good pastry case each time you bake. Short crust pastry is best when making flans and quiches rather than puff pastry that can become a soggy mess when the fillings are added. Egg and bacon flan, or quiche Lorraine, is the traditional quiche but there are a multitude of fillings that you can make for your family. Base the fillings on your family’s favourite foods or even fill them with vegetables as a novel way to use your five portions a day. With eggs as the base of any flan or quiche you will need to stock up before you plan a baking day. Look to buying a large tray of eggs so that you have plenty and do not run out. Set the oven to 210 degrees C or gas mark 7. Break the eggs into a bowl and beat together with the milk. Season with the salt and pepper. Remember that the bacon will be quite salty so do not over salt the mix. Roll out your pastry on a floured board. Lay the pastry over the flan dish and ease the pastry gently into the dish. Press to the sides of the dish and run a knife around the rim to trim off the excess pastry. Prick the pastry with a fork and brush the base with some of the egg and milk mix. Place in the middle of the oven for five minutes for the pastry to set slightly. Heat the oil in a pan and cook the bacon. Remove from the pan and when cool cut away any fat left on the bacon. Dice the bacon and spread evenly on the base of the flan. Slice the mushrooms and fry them quickly in the oil left from the bacon. Drain and add to the flan. Pour in the egg mix so that it does not quite reach to top of the flan sides. Slice the tomato and lay evenly on the top of the mix. Bake in the middle of the oven for about twenty minutes until the flan is set and light brown on top. Note: Why not use up the whole pack of short crust pastry and make two or even three flans depending on the size of your flan dishes. Although it is nice to serve your flan in a china flan dish why not cook the flans in disposable tins so they can go into the freezer when cool? You can then use your best china when serving the meal. 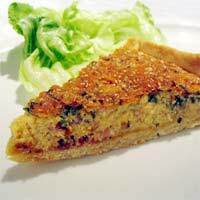 Deeper dishes will give a tastier flan with lots of filling to satisfy the hungriest family member. Cheese and tomato is very tasty. Grate 200g strong cheddar and add three quarters of it to the egg mix. Decorate with the tomato and scatter the remaining cheese on the top for a golden top. Sausage and onion is another filling. Slice cooked sausage with a chopped onion and place in the pastry case before adding the egg mix. Cheese and sweet corn is a good way to use up leftover cooked chicken. Spread this in the flan along with some frozen sweet corn. Add the egg mix and top with tomato before cooking.